Celebrate Malay culture and historical heritage within the impressive collections of the National Museum, then relax in the Lake Gardens,encompassing the National Monument, Orchid and Hibiscus Gardens, Butterfly, Deer and Bird Parks. 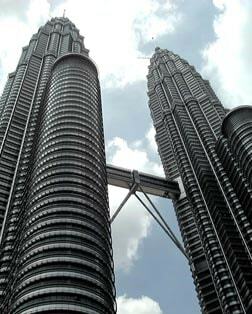 Reaching over 1,400 feet into the air, this architectural wonder is the world's tallest twin towers. A skybridge rising 557 feet above street level connects the two at the 41 and 42 levels. A telecommunications and broadcasting tower that also features shops, an open-air amphitheater, an observation deck, and a revolving restaurant that offers panoramic view of the city. Originally the cricket field for the Royal Selangor Club, today the site includes the Sultan Abdul Samad Building, St. Mary's Anglican Cathedral and the former National History Museum. It was the site of the August 31, 1957 proclamation declaring Malaysia's independence from Britain. Founded in 1884 as a cricket club and social gathering place for members of the British community. Set in a tranquil grove of palm trees where the Gombak and Klang rivers meet, Kuala Lumpur's oldest mosque was built on the site of the city's first Malay burial ground. Here's a splendid opportunity to learn about Malay traditions and customs on a visit to meet a typical Malay family in their home. An English interpreter is on hand as you enjoy refreshments and cakes. One of the most popular Hindu shrines outside of India, this sacred temple complex is full of statues and long-tailed macaque monkeys that greet you as you climb the 272 steps leading to the temple cave.